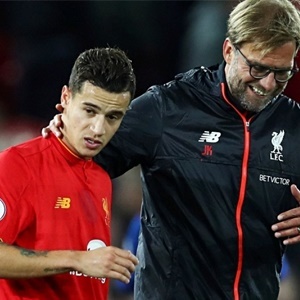 Cape Town- Jurgen Klopp insists he is “not interested” in any comments from Barcelona, as they continue to publicly pursue Philippe Coutinho. Barcelona chief executive Oscar Grau revealed earlier this week that the La Liga leaders are ready to make a January bid for Liverpool star Coutinho after failing to land the Brazilian during the summer. Liverpool rejected three separate bids from Barca for Coutinho, despite the 25-year-old submitting a transfer request to leave Anfield. Coutinho has subsequently returned to the first-team fold and Liverpool continue to stress that he is not for sale, while Klopp says he has paid little suggestion to the noises coming from Spain. “There is another transfer window in January, we cannot change this,” said Klopp. “I have nothing to say about it. It is an open window maybe a few players will change in the future. I have no clue. At this moment I am really not interested.